A dictatorship dominated Portugal for more than 40 years; in Cuba it’s been more than 50. The Portuguese economy was in the hands of 100 families; we are not sure about the Cuban economy, but also very few, and possibly fewer. A deteriorating factor of Portugal’s economy was its engagement in war and the same goes for Cuba. We also coincide in the countries in which these wars were waged: Angola, Mozambique, and Guinea Bissau. In Portugal everything came to an end on April 25, 1974, when young officers who were not part of the oppressive oligarchy, said “enough!” and left their barracks. At 10:55 pm on April 24, the radio station “Emissores Associados” played the song “E depois do Adeus.” It was a warning call. At 1:25 am on the 25th, “Rádio Renascença” transmitted another: “Grândola, Vila Morena.” It was a call to action. Now, there was no going back. As always, many anecdotes took place and history would only register a few. During the first song, four men from Paisano sat together in a car, in the most remote pocket of a park. After the second song they undressed and put on their uniforms. Two homosexuals who happened to pass by, joked about their double condition as homos and military men. The laughter seized after seeing them fully dressed in uniform with the weapons they carried in the trunk. At that exact hour, Captain José Salgueiro Maia gathered his men and told them: “Men, as you well know, there are several forms of State: the social State, the corporate State, and the state in which we find ourselves. Now, on this night, we will end the state in which we find ourselves. So for those who want to come, know that we are on route to Lisboa and we will end this. If you want to come, join our rank and file. If you don’t then stay.” They all joined in and marched toward the capital. His mission was complicated: occupy the Plaza del Comercio, where the Civil Government and ministries were located. The radio did nothing else but transmit instructions to the general mass to stay indoors. Few listened. Everywhere, men and women, workers and students joined ranks behind the lines of soldiers. A general, with a group theoretically under his command, saw and targeted the spectacle. He went as far as slapping a soldier that disobeyed a direct order to shoot Captain Maia. All his shooters disobeyed the order as well and joined the movement instead. From a tank, a soldier asked a lady for a cigarette. Her name was Celeste Caseiro and she didn’t smoke, but she did carry a bouquet of carnations for the cafeteria in which she worked and she gave him a flower, which she stuck in his rifle. Various hands came forth. They all received a flower and repeated the gesture. 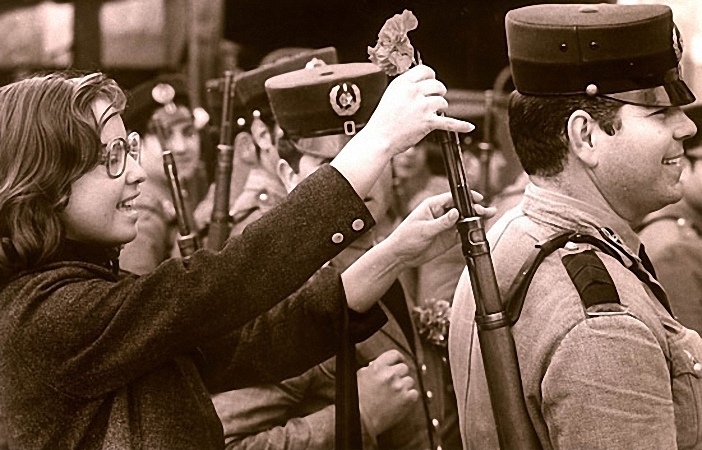 That morning, the florists of Lisbon did nothing but adorn rifles with their flowers in what became known as the Carnation Revolution. A General is nothing without soldiers. A soldier is nothing without the people. All men and women in uniform should remember this and no matter what their pledge, their real loyalties need to be with the people and to their republic, and when the moment comes, their place needs to be with them. Whomever does not understand these lessons needs to remember: tick tock, the clock of History keeps marching on, and it’s not against us.